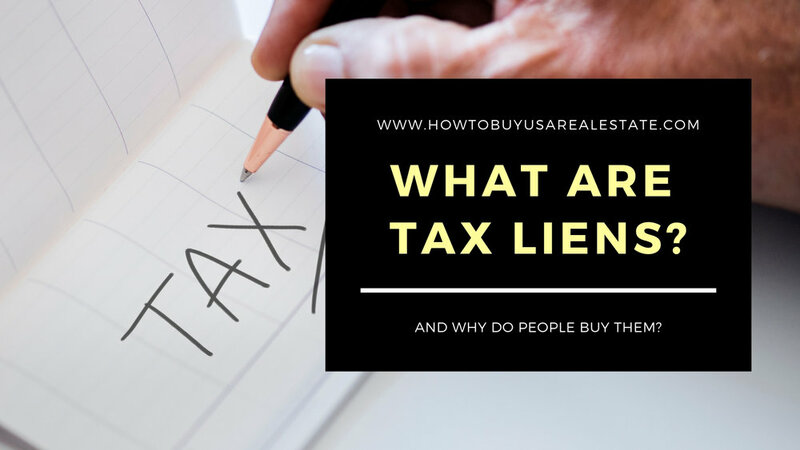 “What is a tax lien and why do they even exist?” I just realized how many of us talk investing in tax liens, but the general public don’t really know what they are. So, let’s create that clarity here. Tax liens and tax deeds sound similar, but are very different so let’s break it down. Tax Lien Investing as an investment strategy may quite possibly be one of the best kept secrets in the business. It is not that the information is not available. I’s likely because there tends to be a negative connotation around any investment that has to do with government involvement, and the fact that people may have lost their home. Therefore, some investors have looked away from this investment strategy. Tax Lien Investing is for the person looking to make a great solid return on their investment, similar to what cash flow would be on a turnkey cash flow property. This investment is strictly a return on investment type of investment, but one that can be lucrative. Ultimately, real estate investors looking to get into tax lien investing, want to look deeper into tax deed investing. I do suggest reading and understand this post on tax lien investing as a prelude to tax deed investing to get the better understanding of how they differ. Each city or municipality has expenses to run their city. Things like fire departments and police departments and schools with school buses and drivers for these school buses, etc. The money needed to run these services comes from a variety of sources that are essentially tax dollars. One of these tax sources is property tax. To continue to run these services everyday, it is imperative the money comes in regularly without fail. If enough people do not pay their scheduled tax bill, it is difficult for the local municipalities and cities to pay their expenses and continue with their community service obligations. Understand that in a non-perfect world there will be, from time to time, people who cannot or will not pay their scheduled tax payment. The city and municipalities had to create a solution to prevent shortfalls in their income stream when these tax payments were missed, so they introduced the tax lien. When taxes are not paid, the city still needs to collect the revenue to maintain its services so they raise the deficit from these unpaid taxes by selling what they call the tax lien certificates. There is a missed property tax of let’s say $1,000.00 for the property at 123 ABC Street. The city sells tax lien certificates where you can buy this certificate for the $1,000. With a guaranteed rate of return (again varies by area but 18 percent is a good average and often higher, which is why investors love these investments), so let’s use 18 percent in this example. You buy and now own the tax certificate for 123 ABC Street for $1000. The owner of this property has typically two years to go to the city to redeem this certificate (called the redemption period).They must go pay the city the $1,000, plus the 18% interest rate, plus any additional fees required by the city. Owners of the property are very motivated to redeem these certificates because if they do not redeem them in the time allowed, they may risk losing the entire house to the owner of the tax lien. The owner of the tax lien essentially has the house as collateral insuring a safe investment. This was a simple example that would play out like that mentioned above if there was only one person who wanted to purchase this tax lien. However because of the incredible returns there may be more than one person looking to purchase the tax lien. If indeed there is more than one buyer, the city may use a bidding process to essentially sell this to the person who wanted to pay the most. Example: A buyer pays $1000 for a tax lien certificate and if he gets a guarantee rate of return for that investment of the $1000 that the certificate is offered for sale for, he would receive ( $1000 x 18% = $180 for a total of $1180). Someone may opt to pay $1,050 for this tax lien because the returns are so great. If they pay $1,050 and only get the original asking price of $1,000 back plus an annual return of 18% they receive ( $1000 plus the 18% or $180 total $1180) This $1180 return on a $1050 investment reduces their ROI to just above 12% but 12% is considered a great ROI. This is why you may find people bidding higher than a tax deed is offered for. Because there are often a number of different tax liens being sold at once, competing for a tax lien does not often exist, but if you attend a tax lien auction and witness multiple bids for one tax lien certificate this is exactly what is happening and your clue that you are bidding against a seasoned tax lien investor. Make friends with them, you may learn a thing or two. What happens if the tax lien does not redeem and the redemption period ends without payment by the owner? When you are strategic in your purchase, the odds of this happening are very slim. When it does occur, you (at the end of the redemption period) can start foreclosure proceedings and take possession of the house. Taxes are always the first lien position on a home, (the lender) if any comes in second. The lender will not want to lose the house to a small tax lien so they will most likely redeem the certificate so that they do not lose their equity position in the house. Should this not happen, depending on city and state rules, you have the right to foreclose on the property and take possession of the home. When you know what to look for in a tax deed you can make sure you are investing in the best tax deeds. For example you can see if there is a mortgage on the property, if not there is no lender to get in your way. If there is you can determine the approximate balance of the mortgage to see how much equity is in the home. Wow this gets exciting when you see the opportunities unfold before your eyes. States and counties dictate the rules for the process and they change by location. Some states are called tax deed states. This is where it gets interesting. However, as with any investment, knowing what you’re doing is important. How to read a property tax record is paramount to success. A tax record can show many encumbrances (possible debt on the property). for example investing in lien on a property that is worth $100,000 but has a $95,000 mortgage on it leaves little room for significant profits, but investing on a lien where that same property has no mortgage or a very small mortgage leaves a large margin for equity profits.. Check back next post to learn how tax deeds work. My friend Mike Wolf, with Mike Wolf Mastery, is a coach and trainer who has been involved in hundreds of these tax deed Sales. Attend a 3 day intensive training with a bus tour and actual tax deed sale where you can actually purchase with Mike by your side. Don’t miss a beat in real estate trends, like, share and subscribe below. The author’s opinion cannot be construed as tax or legal advice, and may not represent the views of HTBUSA or its stakeholders. HTBUSA is not a legal professional tax service. As with any investment, there is an inherent risk in investing in real estate.